Do you have a preference for brown rice or white rice? In my house, I eat brown rice for a variety of reasons, one being that we love the taste. Brown rice is much healthier for you than white rice, and although many people don’t know it – the white rice that they are eating was actually once brown rice. Before rice is ready for cooking, it goes through a chain of different processes. Once it is harvested, the seeds are run through a rice husker or huller that mills it and removes the outer husks of the grain. Once this is complete, you are left with brown rice. Sounds simple, huh? But to get white rice, more steps are taken. The germ and the bran (inner husk) are removed, and then the grain is polished, typically using talc or glucose. These added steps will turn the brown rice into white rice but will also remove nutrients along the way (although in fortified white rice, these are introduced back into the rice – but not all white rice is fortified). This substantial loss of nutrients means that your plain white rice is no longer as nutrient-rich as brown rice. 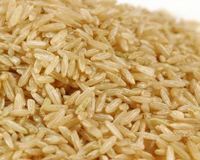 The process of turning brown rice into white rice takes away much of the thiamin, niacin, magnesium, potassium, iron, riboflavin, Vitamin E and Vitamin B-6 that you would otherwise be getting. If you are used to the taste of white rice, switching to brown rice can take some time, but it is so much healthier for you. And once you are accustomed to the taste of brown rice, you’ll likely never care about white rice again. When cooking brown rice, you will need a bit more time than when cooking white rice, but pre-soaking the rice can save you a bit of time. Just pre-soak your rice for fifteen minutes up to an hour prior to cooking. I’ve had a few people tell me over the years that they don’t buy uncooked brown rice because it doesn’t “keep” for very long. But the truth is that, like white rice, you can store uncooked brown rice for just as long as you can white rice as long as it is in an airtight container. All rice should stay fresh for around six months. Mix rice, parsley, cheese, and spinach in a bowl. Stuff mixture into peppers and top peppers with tomatoes and then cover with aluminum foil. Bake at 350 for about an hour.